The purpose built resort Le Corbier was inaugurated on December 30th 1967 with 700 beds, 15 km of ski slopes and 4 skilifts. Le Corbier and Saint Jean d’Arves link up to make one local ski area offering 90km of pistes. There are lovely wide runs which are perfect for Beginners who will soon be ready to graduate to the blues higher up, whilst Intermediates can cruise along enjoying fantastic views or venture further afield into the Les Sybelles area where there are 310km of pistes in total. 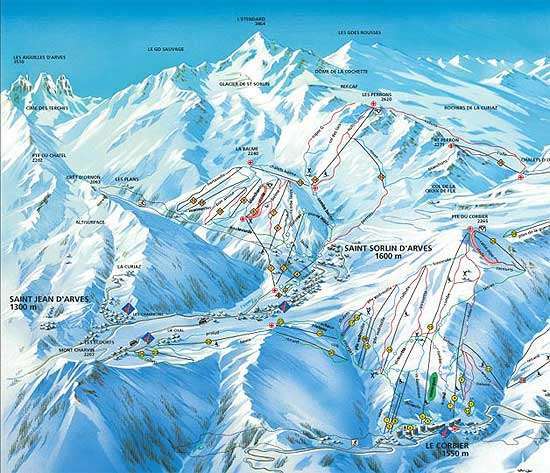 It is easy to travel between the resorts via lifts and pistes, there are connecting pistes to suit almost all abilities. The connecting point to the 6 resorts is Mont Ouillon (2431 m high), the highest European mountain pastures. New ski lifts were created in total respect of the environment, to preserve nature and offer the best ski in breathtaking landscapes.